What a 6 months it has been! Back in August 2016, I (with the support of the rest of the Cake Team), put out a "call to arms" to the Cake Community. What we were trying to address was the potential stagnation of Addin's and Modules that were created by the Cake Community. Full details of what we were trying to address can be found in this blog post. This last point is important, and I am particularly happy that maintainers have chosen to do this. What this means is that, if a maintainer were no longer able/willing to support an Addin, the Cake Team would be in a position to continue to push updates to the same package id on NuGet.org. As a result, we can ensure the continuation of support for that particular package. NOTE: Again, I want to stress here that this would only ever happen after every effort was made to get in touch with the original creator of the Cake Addin. 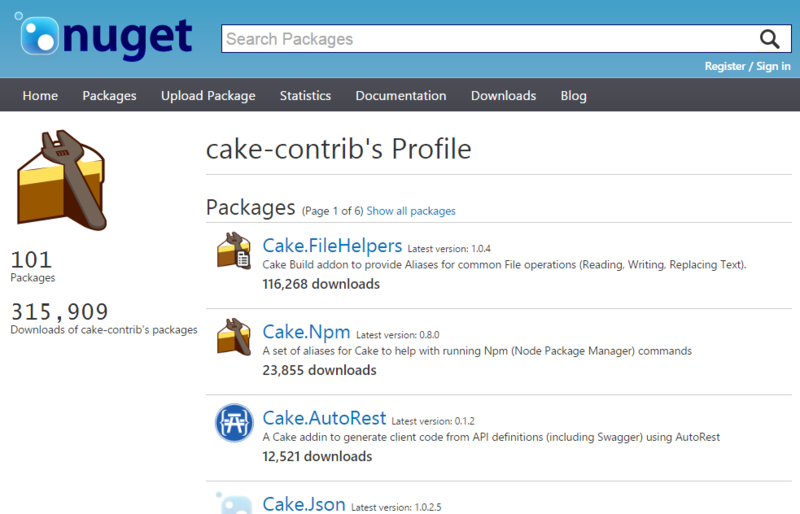 A very useful site effect of the cake-contrib user being added to so many NuGet packages is that we get a clear indication of the usage of the Addin's. As of today, the packages that have been added to the cake-contrib user have been downloaded 315,909 times! I am continuing to encourage Addin and Module creators to both document, and add the cake-contrib NuGet user to, packages that they create. I am tracking this on this GitHub issue. From time to time I check NuGet.org for new packages that have been pushed, so don't be surprised if I raise some issues on your repository once I know about the existence of the package. This is not meant has any form of harassment, so apologies if it feels like that, but rather, trying to do what is best for the larger Cake Community. Once again, a huge thank you to all the Cake Community, we very much appreciate your time, and Cake wouldn't be where it is today without you.